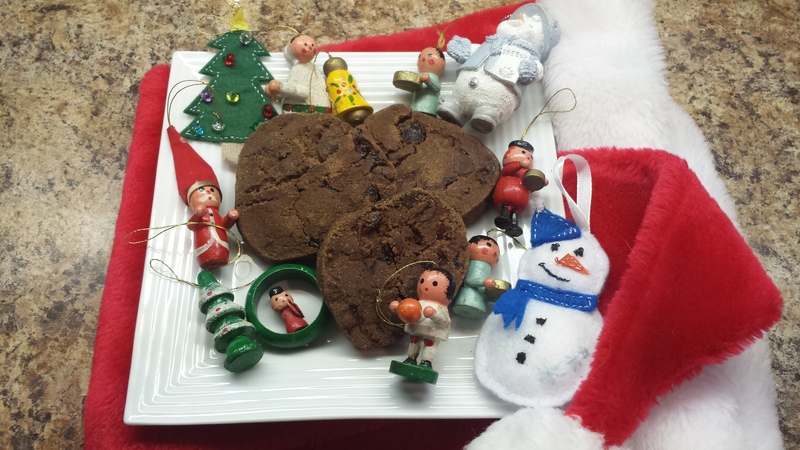 The 2014 Great Food Blogger Cookie Swap – our submission! At last, it’s here, it’s here! Ok, without further ado, here is the recipe and some photos of the most delicious cookies this side of the 49th parallel, our “Release The Kraken!” Drunken Double Chocolate Cherry Cookies! We couldn’t resist this luscious sounding cookie recipe from one of the foremost authorities on modern baking, Dorie Greenspan! But of course, we had to add our own little touches to make it ours; in this case, we added deliciously chewy dried cherries that have been soaked in a potent dark spiced rum called Kraken – if you haven’t heard of it, go get some now from your local liquor store! It’s so worth it. This recipe is also dairy-free, to accommodate one of our Cookie Swap recipient’s requests, but it can also be made with butter and regular semi-sweet chocolate chips if you’re not living Dairy-Free (DF). Sift the flour, cocoa and baking soda together. Set aside. Beat the margarine on medium speed in a stand mixer until soft and creamy. Add both sugars, the salt and vanilla extract and beat for 2 minutes more. Carefully add the flour mixture into your wet ingredients until flour is just mixed into the dough – about 30-45 seconds. Do not overwork this dough; don’t be concerned if the dough looks a little crumbly at this stage. Toss in the chocolate pieces and soaked cherries and mix only to incorporate. Turn the dough out onto a work surface, gather it together and divide it in half. Working with one half at a time, shape the dough into logs that are 1½” diameter. Wrap the logs in plastic wrap as tightly as possible and refrigerate them for at least 3 hours. Center a rack in the oven and preheat the oven to 325°F (160°C). Line two baking sheets with parchment paper or silicone mats. Working with a sharp thin knife, slice the logs into rounds that are ½” thick. The rounds are likely to crack as you’re cutting them; don’t be concerned, just squeeze the bits back onto each cookie. Arrange the rounds on the baking sheets, leaving about one inch between them. Bake the cookies one sheet at a time for 12 minutes, rotating and moving the baking pans at the 8 minute mark to ensure even baking. Note: at this stage they won’t look done nor will they be firm, but that’s ok. Transfer the baking sheet to a cooling rack and let the cookies rest for about 10 minutes, then transfer cookies directly to cooling rack to cool completely. Make ahead: Packed airtight, baked cookies will keep at room temperature for up to 3 days, and they can be frozen for up to 2 months. They can also be frozen in log form for months, and can be sliced and baked directly from the freezer, adding a couple of minutes to the baking time. Rum Soaked Dried Cherries: to effectively soak dried cherries, heat ½ cup rum until steaming but not boiling; add the chopped dried fruit and let soak for a minimum of 10 minutes but no more than 30 minutes. Remove the soaked fruit and squeeze as much moisture out of them as you can. As for any remaining soaking liquid, we suggest you drink it or add it to the fruit for a pie or fruitcake! Previous Post A Very Grumpy Cat Christmas to you all! I love chocolate and cherries together. These cookies sound great! Oh yes, they are delicious!